The curtain came down on a season to forget for EKP with a comprehensive defeat at the hands of reigning champions Tamworth. Phoenix cliched the Northern Conference title and now move on in their attempts to retain the Britball crown. Early exchanges were tentative until Tamworth scored on their third possession. A 2-play drive was all that was required with QB Sam Huxtable running the ball home from 15 yards. Mark Bonazebi, who was to be perfect on the day, also kicked the PAT. East Kilbride were soon forced to punt and again it only took two plays for the hosts to score. Huxtable found James Hossack for a 41-yard TD which was duly converted. Despite forcing Tamworth to punt early in the second quarter, EK were to ommediately give up more points. Neil Baptie’s 1st Down pass was intercepted by Oli Campbell who returned it 56 yards for the pick-6. The hosts were now getting into their stride and increased their lead with a 12-yard run by the elusive Huxtable. That advantage was stretched fiurther when Huxtable again connected with Hossack, this time for an 11-yard TD. Bonazebi’s conversion made it 35-0 just before the break. 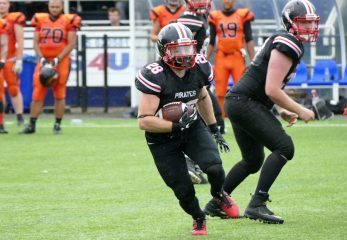 The Pirates did briefly threaten when a 9-play drive took them to the Tamworth 6-yard line, but a 4th Down interception ended the period. With a running clock now enforced, there was only one score in the 3rd Quarter and that came on a 76-yard punt return by Bonazebi, who then converted his own TD. The final period saw Tamworth add two more scores. On the first play of the quarter, relief QB Angus Cook passed to Alex Lenkowski from 7 yards. Then, with the Pirates’ defense doing their utmost to avoid giving up a 50-burger, their hearts were broken on the very last play of the game when a 19-yard pass from Cook to Huxtable, now playing at WR, took the score past that particular landmark. So a disappointing year finally comes to a close and the Pirates must now regroup and start preparations for the 2019 campaign. This could see them renew old acquaintances and/or meet new opponents as they endeavour to return to top flight football in the shortest possible time.